Nate Meeks is not your average freshman basketball player. The 5-foot-11 guard for Union High is not only playing varsity in ninth grade, he’s playing well and playing often. His 12-point performance in Union’s first-round WPIAL playoff win over Winchester Thurston earned him Lawrence County’s high school Athlete of the Week award. The honor is sponsored by Washington Centre Physical Therapy and selected by the New Castle News sports staff. The students at Union know just how good he is already, too, loudly chanting “he’s a freshman” after Meeks knocks down a three or gets a layup to drop. Meeks made an immediate impact for the Scotties this season, scoring 15 points in the first game of the year, a 58-45 home win over Freeport. Meeks, who’s averaging 6.7 points per game and hitting 1.3 3-pointers per contest, says he didn’t anticipate all the early success. 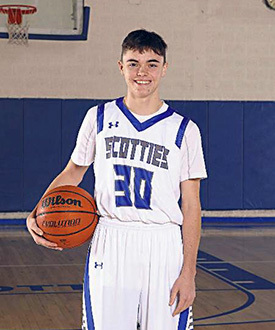 His 30 3-pointers this season place him third on the team, while his smooth shooting stroke is important for a Scotties offense predicated on floor spacing. Possibly Meeks’ greatest contribution of the season came in the Scotties’ most important game yet. With Union holding a slight lead over Winchester Thurston in the first round of playoffs at Northgate High, Meeks hit three important 3-pointers in the second quarter to spark the Scotties’ offense and help the team pull away. For Stanley’s club to continue its run through the playoffs, it likely will need Meeks to continue to step up. Meeks says he knows he’ll be expected to continue to contribute and that he’s up for the challenge.